Here we are training DialogDevil to close Python when it crashes. 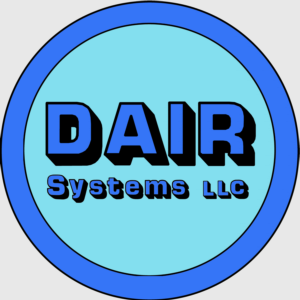 We can set the address of a batch file (command file) to execute on the Edit target tab. 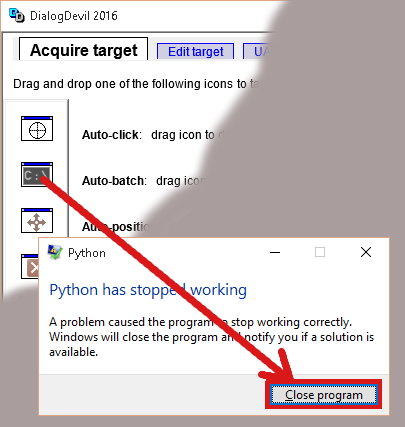 Subsequently, whenever Python stops working, DialogDevil will click the close program button and execute the batch file. DialogDevil automates mundane tasks and speeds up your work. Do you have Windows servers which hang because an application is waiting for a response? Don't let user complaints tell you your server is not responding. Get a DialogDevil site license (specify quantity of 200) and put DialogDevil on every server and client in your company for even more productivity. If Windows Update popups on your screen every 10 minutes during an important presentation, you look like a jerk. Take control with DialogDevil and have virtually any dialog auto-clicked so you do not have to answer. When the response to the occurrence of a dialog requires restarting a process, alerting someone, or initiating recovery, use the auto-batch tool. It will click the dialog to close it and then execute a batch file you designate. Set the initial size and on-screen position of windows when they open. Rather than some uncoordinated one window on top of another desktop, you arrange the windows you use most to be most productive. Now click each window to memorize size and position and that each window's position in your arrangement is remembered. Auto-position works across multiple monitors. Note that auto-position sets the initial position when the window opens. When you run the application again and re-open the window, it opens in the position and size you lasted entered via the auto-position tool. These three tools extend the functions found on most windows. Now, you can minimize, maximize, or close specific windows when they start up.